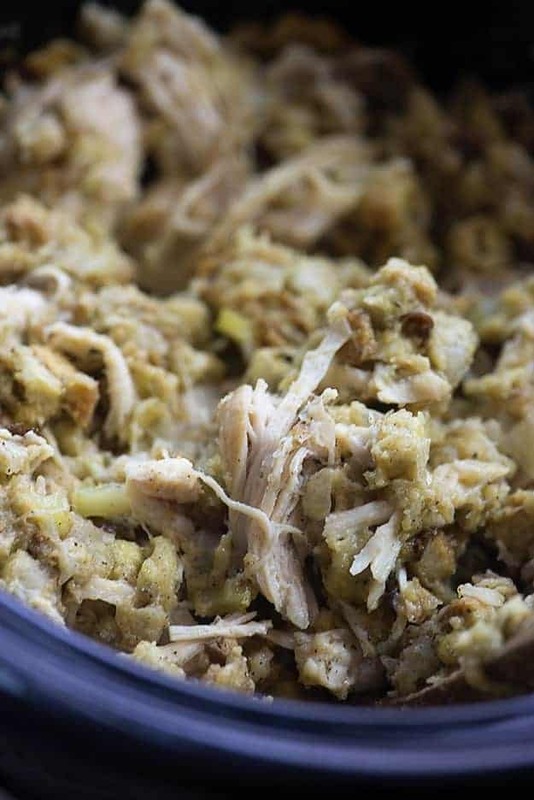 This crock pot chicken and stuffing is the easiest comfort food you’ll ever make! Toss everything into the slow cooker and let the magic happen! Alright, so I don’t want to alarm anyone, but I often eat a bowl of Stove Top Stuffing for breakfast. Hold up. Don’t leave me. I swear I’m not insane. It’s just, as a kid, I never liked or ate oatmeal, but some days I needed something warm and hearty and…Stove Top Stuffing was there for me, man. And I never outgrew the habit. I know it’s totally unhealthy. I know that I’m an adult and should make better choices. I know that I am strange. But, y’all. It’s so darn good! I’m going to really freak you out when I say this, but I always melt a piece of the weird plastic-y orange American cheese over the top of it and stir it all together. I am weird. Please do not be frightened. Annnnnnyway. 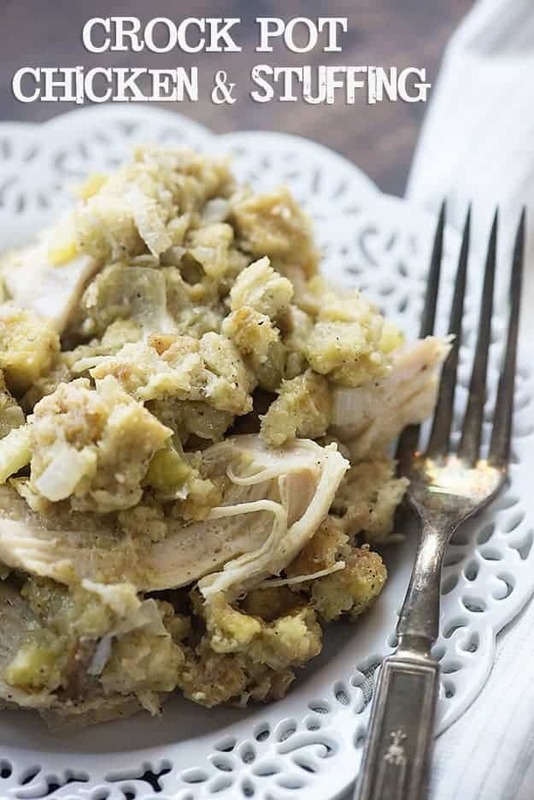 Let’s forget I said anything and instead talk about this Crock Pot Chicken and Stuffing, which I swear is really good and totally normal and even though I eat weird things sometimes, you can totally trust me. You don’t trust me anymore, do you? You have some weird food secret that you’ve never shared with the Internet before. I dare you to share it in the comments. It’ll be like a little support group down there, all of us sharing our weirdness and coming together to stop the hate. 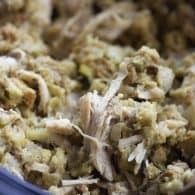 So, back to this slow cooker chicken and stuffing. It’s pure comfort food and it’s tossed together in a flash. I started with a bag of dry stuffing cubes, stirred in some chopped celery and onion, mixed that all up with some cream of chicken (try my cream of chicken soup substitute, if you like! ), a tiny bit of broth, and then seasoned it with a little sage. I plopped a couple chicken breasts on top of all that and let the slow cooker do it’s magic! Easy peasy. A lot of you have tried putting the chicken breasts on the bottom of the slow cooker (I have too, because it seems like the obvious way to do it), but I don’t love it that way. The chicken releases a lot of juice and if it’s all sitting at the bottom, the stuffing on bottom is soggy and the stuffing on top is dry. If you put your chicken on top of the stuffing, the juices soak down into the stuffing to come out with the right consistency. This recipe takes about 4 1/2 hours in the slow cooker and it’s going to taste like a slow cooker full of Thanksgiving goodness that you can eat any time of the year. I recommend that you make this a whole big feast and serve it with my roasted sweet potatoes and pumpkin crunch cake to really bring home that Thanksgiving at random times of the year feel. Or just be normal and eat it with a salad. Whatevs. 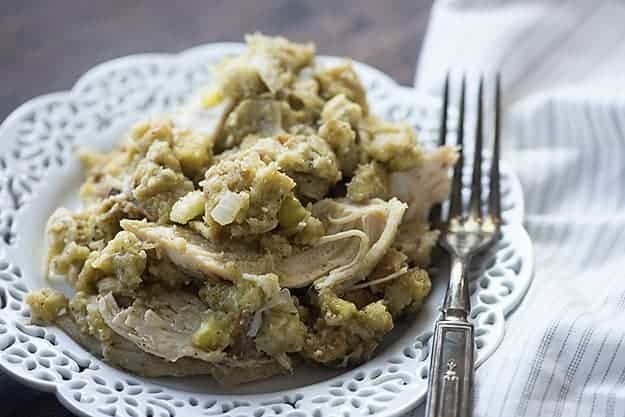 This crockpot chicken and stuffing tastes like a Thanksgiving dinner in one bite. 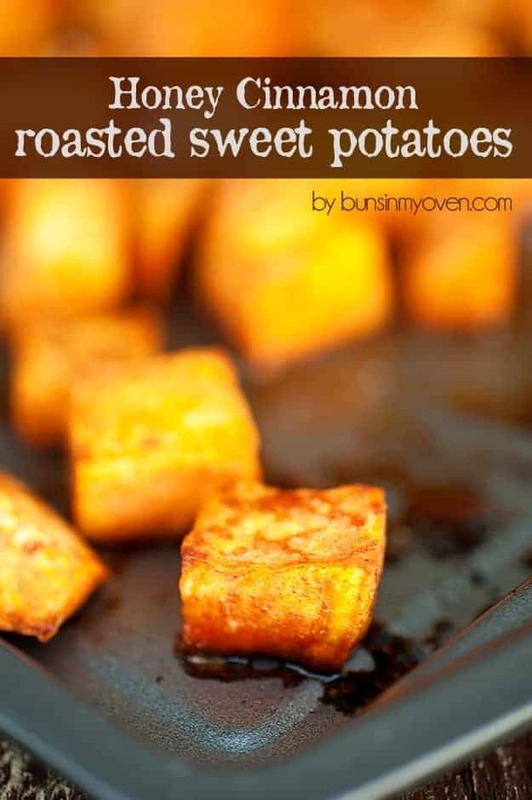 Serve it alongside some sweet potatoes and green bean casserole for a real feast! Spray a slow cooker with non-stick spray. Add the stuffing mix, onion, celery, cream of chicken soup, and chicken broth to the slow cooker and stir to combine. Sprinkle the sage over the top. Lay the chicken breasts on top of the stuffing mixture and season with salt and pepper. Cover and cook on low for 4 hours 30 minutes or until chicken cooks through. Shred the chicken with two forks or remove to a cutting board and slice into small pieces. I like my green beans with ketchup too! I have scrambled eggs on top of shredded wheat (softened) for breakfast! 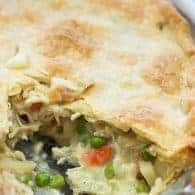 Yum….. BYW, could you use chicken thighs in this recipe? I haven’t tried this with thighs, but I think it should work fine. I’m going to try it this weekend with thighs. I find they usually substitute fine and we like them better than chicken breasts. I’ll let ya know! I like hard boiled eggs and green onions in my mashed potatoes…. Hmm, kind of like a potato salad…I could get down with that, I think. I think you probably could, but I haven’t tried it. Cream of chicken soup is basically just an extra thick gravy with bits of chicken in it, so regular gravy might just make it more moist. Can I put a couple boxes of stovetop? It’s my kryptonite! I love Stove Top too! But, it’s such tiny pieces, I’m not sure it will hold up as well in this recipe as the traditional bags of stuffing mix since those are bigger chunks. Shavaun, I made this last night with stove top & it was dry & salty and didn’t hold up well. ?? I usually follow the recipe to a T when I first make it but didn’t this time. I used frozen chicken breasts. I hope it works out! Do you think it’ll produce more or less liquid? I’m really not sure. Hope it worked out well for you! Did the frozen chicken work ok?? Aaron i love PB and miracle whip or dukes ,its the bomb! could i do on high for half the time? I haven’t tried this one on high. I wonder if the bag of corn bread stuffing, similar to the bag of herbed stuffing, would work? Well u screwed this up. I used condense cream of mushroom. It is so salty. I just tried to thin it out with water. Let’s hope it works. Lol. I meant I screwed this up. Damn smartphone. I was actually looking through the comments, to see if anyone used cream of mushroom soup. I am not a fan of cream of chicken soup at all. How did it come out? Weird food reminds me of my Dad. He used to like onion and HP sauce sandwiches. I regularly put ketchup on my Mac and cheese and I’ll eat a whole jar of pickled beets in one sitting can’t wait to try this! Why does everyone hate on ketchup with mac n cheese? It’s delicious! As mentioned, if Cream of Mushroom was too salty, could you use low sodium soup? Yes, low sodium is fine. A tuna salad sandwich and a banana, one bite of sandwich, one bite banana at the same time!! Also, a peanut butter and banana sandwich. YUM! 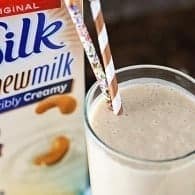 Can someone please tell me if this recipe is freezable and still tastes good? I would be cooking this only for my hubby and would want to freeze leftovers into single servings. TIA for any help. Have Any if you tried this with turkey tenderloin breasts? Would the cook time be different? Peanut butter sandwich with either mustard or pickles. Not both at the same time though! I eat peanut butter and mayonnaise sandwiches is that weird. I think so, but I also think a lot of people do that. I’ve never tried it! Could this be doubled? 2 bags of stuffing, 4 cans of soup, etc? Could this be doubled? 2 bags of stuffing, 4 cans of soup, etc? more chicken maybe? I think it probably could be if you had a large enough crockpot, but I haven’t tried it myself. I’m trying it today, hope it works being doubled. I haven’t tried this without the chicken. They release quite a bit of liquid that adds to the stuffing, so I’m not sure it would work that well. I made this with stovetop and frozen chicken breast. And 5 hours in and it’s mushy and the stuffing did not hold up well. Any suggestions to fix this so I don’t have to make a second dinner tonight? I would love to try this recipe but I can’t find a 14 ounce bag dried seasoned stuffing mix. All I can find at the stores is Stove Top stuffing and Mr’s Cubbison’s stuffing (both in boxes) Can you suggest a brand to look for or a place to find it? I’m in central CA. Thanks for your help. 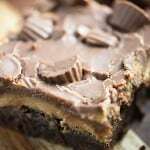 I really want to try this recipe.